Bactrian camels have two distinct humps on their backs. Dromedary camels have only one hump. Many think the humps contain water, when actually they contain fat rich with dissolved minerals. Because only an estimated 1,000 Bactrian camels still live in their native range, they are considered an endangered species. However, the majority of the estimated 1.5 million domestic camels of China and Mongolia are domesticated Bactrian camels. 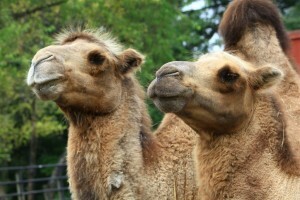 Domestic camels are used for transportations, milk, meat, hides, and wool. Mona-Sasha (born March 26, 2003) lives outdoors year-round with Jack (born February 2014). They both like the snow, ice and cold. They will chew on ice that may have frozen in their water tank overnight. The camels’ hair grows out over the winter into a beautiful coat, which they will begin shedding in May.